Cocos nucifera or the Coconut palm is the universal symbol of the tropics. The Coconut palm is valued for their ability to exposed coastal locations, prospering best in areas of high rainfall, high water tables and warm temperatures. 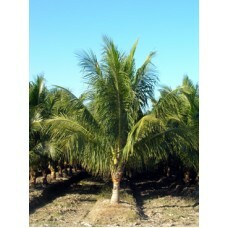 The Coconut palm is rated for Zone 10B and wil not tolerate a freeze of long duration or temperatures below 28 degrees.